It’s my favourite time of the year, which means it’s time to start writing your artsy Christmas lists! I love love love getting art journal supplies in my stocking, and really, what art journaler wouldn’t? 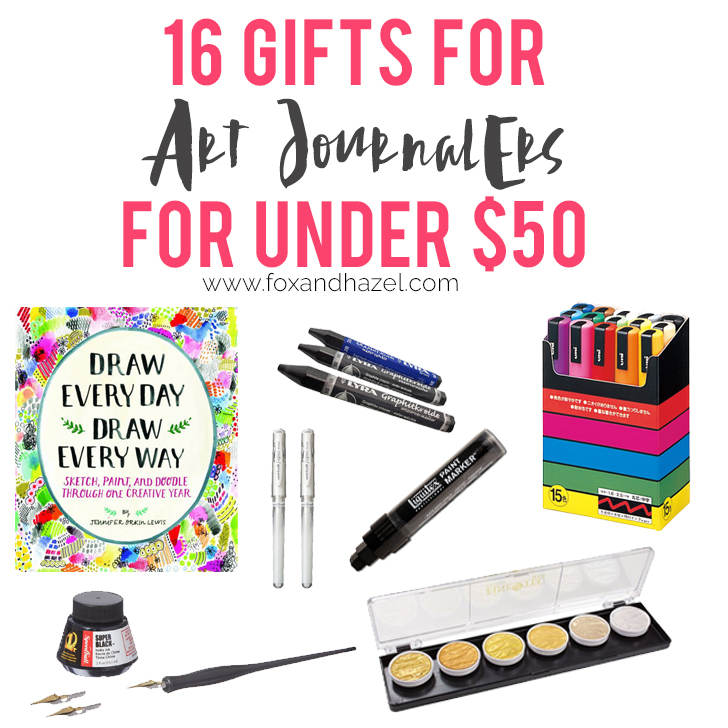 I’ve rounded up 24 gifts for art journalers that are all under $50, and most of these are art journal supplies I have used personally and LOVE. And of course there are a couple of things off my own wish list too 😉 So, onward to this fantastic Christmas list of art journal supplies! 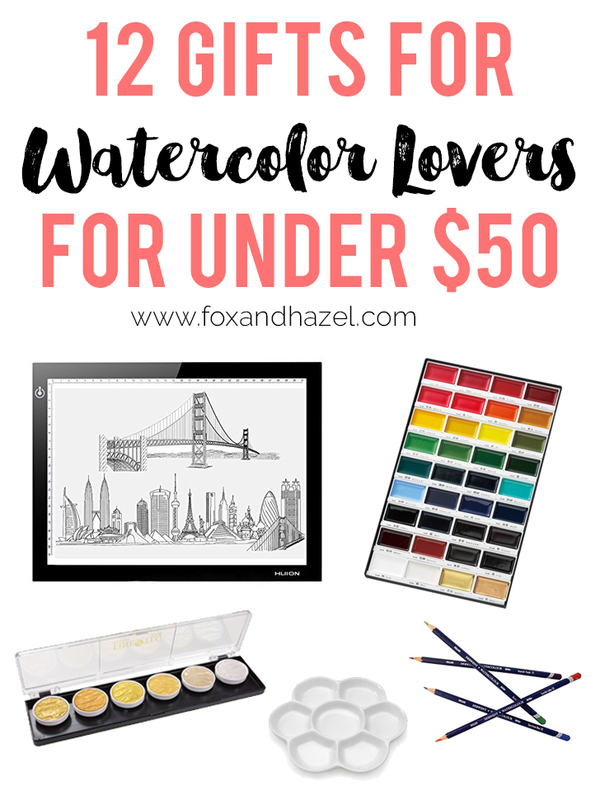 Prima Marketing Watercolor Confections – Tropicals These have been all over Instagram since summer, and I want to get my hands on a set of them! The tropical colors are vibrant and saturated – just what I love. Tim Holtz Distress Crayons Set 5 I started using these after I made my mystical animal cards from the StencilGirl and Tim Holtz blog hop, and now I am totally hooked! This set is a bit lighter and brighter, which makes them great for layering. Tombow Fudenosuke Brush Pen Set I live and die by these pens. So much so that my stocking had 6 of them in there last year, haha! The brush tip is great for writing and adding fun marks to your pages. Golden Fluid Acrylic Paint in Iridescent Bright Gold This is my personal tried and true gold paint, and it never fails to add the perfect metallic shine to my work. The fluid consistency makes it perfect for painting, lettering and dripping all over your art journal page! Liquitex Ink in Quinacridone Magenta This is also another one of my tried & true favourite shades of ink. It is intense and rich, and flows wonderfully all over the pages. Liquitex Inks in general are fantastic and few of these would be great stocking stuffers! 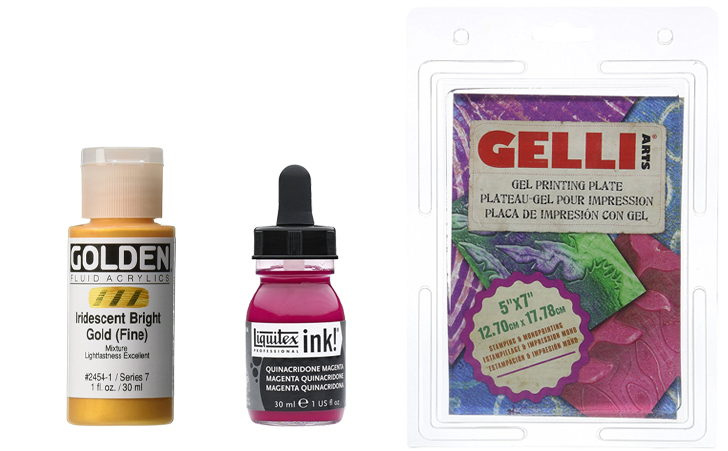 Gelli Arts Gel Printing Plate – 5″ x7″ This size is great if you’re new to gelli plate printing, and is actually awesome for making cards with too! I have the 8″x10″ and 3″x5″, but I might have to add this to my collection this year. Sakura Gelly Roll Moonlight Gel Pens These are another one of my absolute favourite art journal supplies. These really show up as a true fluorescent on the page and can also be uspseudoa psuedo watercolor ink! Wood Block Printing Stamps I found these and think they look SO fun to try out in art journaling. The wood stamps means it won’t give a perfect image every time. But I think the rustic stamped images would be just lovely in a spread! StencilGirl Stencils (Connected Hard Triangles by Rae Missigman) Of course I had to include the amazing stencils from StencilGirl! Their collection is wide and vast and they have every stencil you could imagine. I’m personally a huge fan of Rae Missigman and Roxanne Coble’s stencils! Paint Water Coffee Mug This mug is hilarious, because I think every artist has accidentally drank paint water at least twice in their life. This also has a second “Not Paint Water” mug that would make a fun set to get or gift! I love funny gifts for art journalers! Slice Precision Ceramic Craft Knife If you do any kind of cutting of paper for your work, then this super precise ceramic craft blade is a must have. It cuts like butter and the tiny blade makes even the smallest cuts a breeze. Intuitive Painting Workshop by Alena Hennessy I bought this book almost two years ago and it is still one of my go to art journaling books. Although it’s for painting, all the techniques in it can be translated onto journal pages. It is bursting with so many great ideas! Jane Davenport’s Mermaid Markers These markers are probably in my top 5 supplies that I love and use obsessively. They are dye based ink brush pens that have the most delicious colours and are great for layering and sketching with. Get them, love them, obsess over them! Shimmer Paintz Shimmerz and Blingz Shimmery watercolor type paints that come in a wide range of colours and are addicting to use! 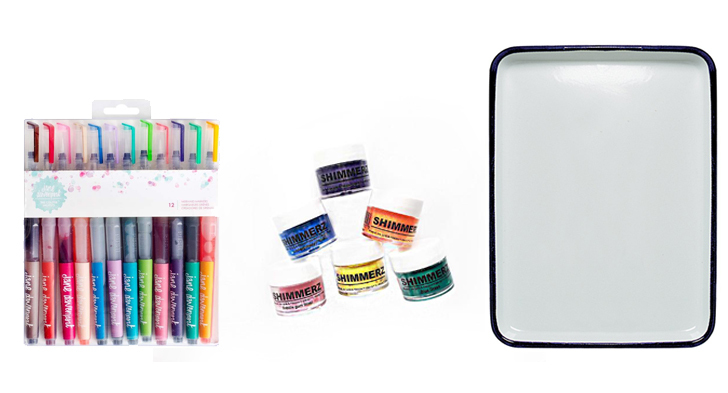 Shimmerz paints also has sprays, texture pastes in varying shades of shimmer from matte to super shimmery glam! If you want to try these paints out, be sure to mention my name in the checkout (Torrie) to get a free sample in your order! Enamel Butcher’s Tray Paint Palette I picked up one of these for my acrylic paints, because Lord knows I have enough watercolor palettes, but needed a bigger palette for my acrylics. This bad boy is the perfect size to sit on your desk and mix paint in! It really could be used for any type of medium from watercolors to catching glitter. Super multi-functional and durable! The Artist’s Way by Julia Cameron This book has been around a long time (25+ years in fact) and is a fan favourite among artist’s around the world. It comes highly recommended by several of my art journaling peers who swear by their morning pages! Yupo Paper Polypropylene Paper Yupo Paper is a fun new substrate to work on if you love using watercolors or alcohol inks. Yupo is a plastic paper, so the paints all float on the top of it rather than being absorbed. This makes for fun interactions and creates unexpected designs! Tombow Dual Brush Pens – Galaxy Set Is this even a gift guide if there isn’t Tombow Brush Pens on it? Ha! I love my Tombow Brush Pens! They released this gorgeous galaxy themed set this year, which is a great mix of cool blues, purples, pinks and greens. Moleskine Art Plus Pocket Sketchbook This little pocket size Moleskine is the right size for on the go art journaling or sketching. It is small enough to fit in a purse or a large clutch. Throw in some pens, markers and water brush pen and you’re ready to create on the go. Sennelier Oil Pastels Set of 12 Oil pastels are quickly becoming a favourite of mine, and Sennelier makes the creamiest most vibrant ones out there. This intro set is perfect for anyone who wants to try oil pastels and doesn’t want to spend too much on an entire set yet. 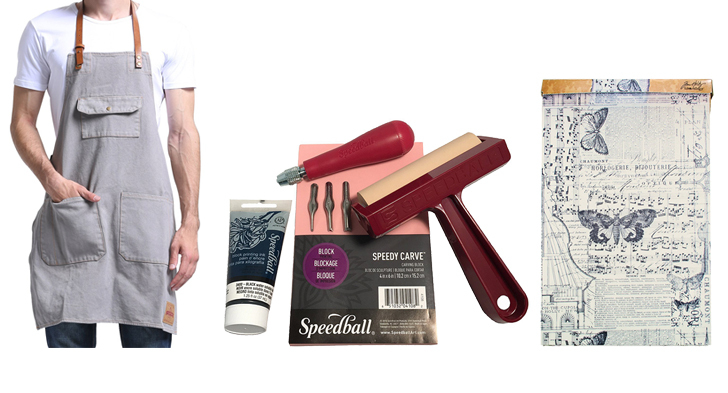 Speedball Block Printing Kit Another element I love adding to my art journaling is stamping, and I love carving my own stamps! 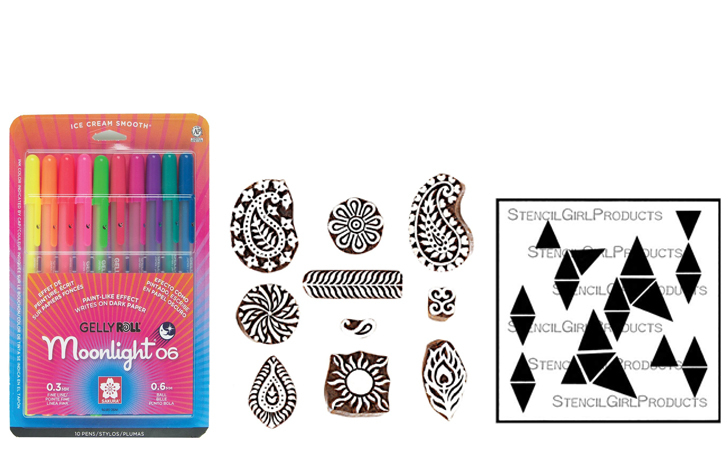 Even though this is a block printing kit, you can also use it for creating stamps as well. Or leave it big and create a really awesome block print! Tim Holtz Melange Tissue Paper This is a new addition to my paper bits collection, and I see why it is such a fan favourite among mixed media artists and art journalers. It is great to collage with, and the varied pattern really adds texture to any page you’re working on! That’s it guys! 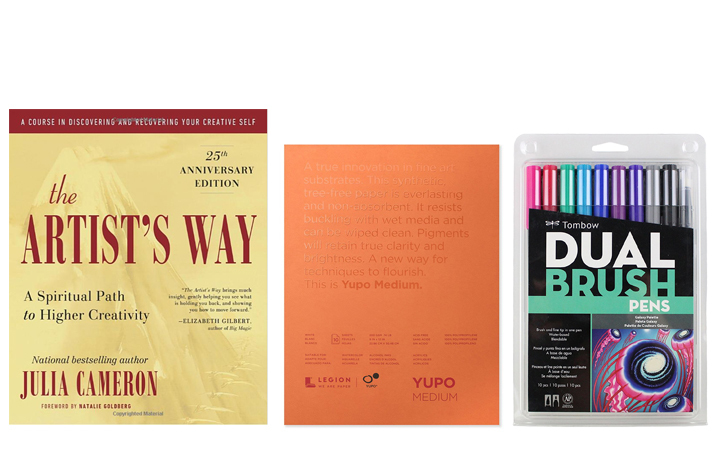 There is my top 24 gifts for art journalers, and they are all well under $50. A few of these are on my list and I’ll report back if they live up to the hype! 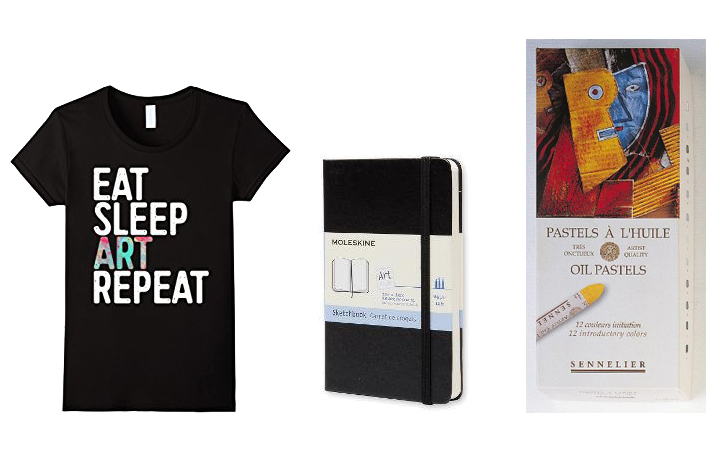 Want even MORE ideas for gifts for art journalers? 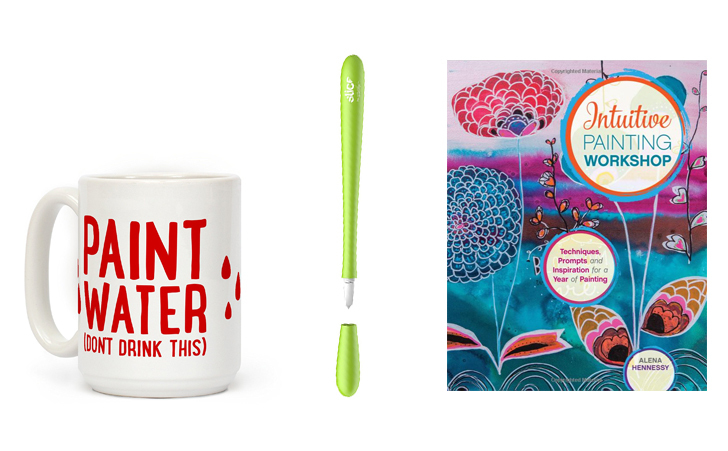 Be sure to check out my previous gift guides with even more art journal supplies and ideas!